What could be more luxurious than a mens cashmere scarf? The soft, shiny, lightweight yarn that goes into this is the reason why. A cashmere scarf is not only stylish, but also warm. Cashmere yarn comes from a cashmere goat and other goats. High in the Mongolian mountains the wool is hand plucked every year. It is then woven into either two or three ply yarn to make into luxurious apparel.The undercoat of the goat is fine and the outer layer is straighter and coarse. The strength of the fiber comes from the combination of the two types of fleece. A mechanical process separates the coarse fleece from the fine. After this step cashmere is ready to be converted into yarn and may end up in your clothing. The yarn is in great demand for its durability and warmth. 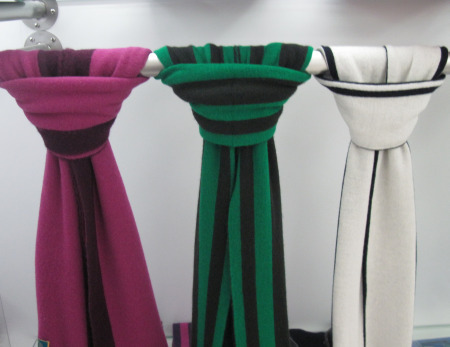 The variety of types of mens cashmere scarf is growing. As time goes on, the dyeing process allows patterns to come into the finished product. Most of the scarves are in neutral tones to go along with the majority of men's clothing. However there are some that do stand out. Cashmere can also be mixed with silk to make a shinier yarn. The softness remains almost the same and the warmth is still there. Also available are scarves that are silk on one side and cashmere on the other.The choices are virtually endless. Some people may hesitate to purchase apparel because of the cleaning process. Cleaning a scarf is not a huge issue. It is not advisable to always dry clean the scarf. The yarn can be damaged by the chemicals used in the dry cleaning process. Cashmere yarn needs some special handling. This will maintain is luxurious texture. Stains that are very bad may need to be dry cleaned, however. Hand washing apparel made from cashmere yarn is the advisable method to use. Using a very mild detergent, lukewarm water or even baby shampoo and lukewarm water is best. Rinse the yarn in cool water. To maintain the scarf's softness during the cleaning process you may want to use some hair conditioner in the rinse. Do not wring out the scarf. Place it on a towel that has no dye and roll the towel. This will blot the water from the yarn. This may have to be done more than one time. Place the scarf on a different towel and lay flat on a sweater rack. After a few cleanings, your cashmere yarn may pill. Do not brush the garment. Do not use a lint remover. Cleaning the garment in water will help remove the pills. The remainder should be removed from the yarn by hand. Your cashmere mens scarf can be stored safely during the warmer seasons. Be sure to complete the cleaning process before storing. Protect the yarn from moths by keeping the scarf in an airtight plastic container with mothballs or cedar chips. Your scarf will last for many cold seasons with proper care.